HAS-A relationship is based on usage, rather than inheritance. In other words, class A has-a relationship with class B, if code in class A has a reference to an instance of class B. Here you can say that Student has-a Address. Student class has an instance variable of type Address. 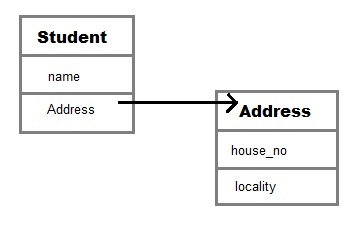 Student code can use Address reference to invoke methods on the Address, and get Address behavior. Aggregation allow you to design classes that follow good Object Oriented practices. It also provide code reusability. Book is Java. price is 550. Author is me. Q. What is Composition in java? Composition is restricted form of Aggregation. Composition can be described as when one class which owns the other class, is destroyed then the other class cannot exist meaningfully without it. For example a class Car cannot exist without Engine. Q. When to use Inheritance and Aggregation? When you need to use property and behaviour of a class without modifying it inside your class. In such case Aggregation is a better option. Whereas when you need to use and modify property and behaviour of a class inside your class, its best to use Inheritance.